The Deccan Plateau derived its name from the Sanskrit word "dakshina" which means "south". It is a huge, raised, triangular plateau that makes most of South India. It is flanked by the two magnanimous mountain ranges of the Western Ghats and the Eastern Ghats while the Satpura mountain ranges crowns the plateau in the north. The principal rivers flowing through the Deccan Plateau include the river Krishna, Godavari and Kaveri, where they flow towards the Bay of Bengal. The Deccan Plateau has a rich history of powerful dynasties ruling in the past, such as the Pallavas, Satavahanas, Chalukyas, Vijayanagara Empire, Marathas, to name a few. All of these empires have helped in shaping the culture and traditions of what we see today in these states. With rich culture, heritage, natural resources and more, touring through the Deccan Plateau is a must. Here are the popular attractions of Deccan Plateau that you must visit. Badami is a historically significant town that used to be the capital of the Badami Chalukya dynasty between 540 AD to 757 AD. The town is well known for the stunning rock-cut cave temples built amidst the rough outcrops of red sandstones. It is surrounded by the beautiful Agastya Lake enhancing the beauty of the entire place. These cave temples were built during the Chalukyas period, an example of their brilliant style of architecture. Other places to visit in Badami include Badami Fort, Bhuthanatha Temple, Badami Museum, etc. The capital city of Telangana and Andhra Pradesh, Hyderabad, is a culturally rich city that has a great influence from the Nizams of Hyderabad. Feel the old-world charm by walking through the streets of Hyderabad while visiting popular tourist places like the Charminar, Chowmahalla Palace, Hussain Sagar Lake, etc. Don't forget to try Hyderabad's delicious Mughlai biryani in local food stalls. Shop at the old bazaars of Hyderabad like the Laad Bazaar, Sultan Bazaar and Begum Bazaar. The ancient town of Hampi was an important centre during the rule of the Vijayanagara Empire. This is evident till date due to the numerous monuments that are spread across the temple town of Hampi. Witness the brilliance of Vijayanagara Empire's architecture by visiting temples like the Virupaksha Temple, Krishna Temple and market complex, to name a few. These monuments have been declared as UNESCO World Heritage Sites due to their stunning beauty. Also visit the beautifully built musical pillars of Vittala Temple, elephant stables, Lotus Palace and more at Hampi. Mumbai is not only the most happening city of India, but also bears the heritage of the British Raj. This city of dreams has one too many places to visit for tourists and gives the best travelling experience since the people of Mumbai are known for being warm and friendly. Visit the Gateway of India, relax in the Juhu Beach, pilgrimage to Haji Ali Dargah, Siddhivinayak Temple and more on your visit to Mumbai. Bidar is a city perched on a hill, towards the north-east of Karnataka. The city's main tourist attractions are the ruins and monuments built by the Bahmani dynasty who ruled Bidar in the 15th century. The most popular hotspot of Bidar is the ruined Bidar Fort. This rustic fort is so beautiful that it is one of the sought-after shooting destinations for movies. In fact, scenes from the popular Bollywood movie, Dirty Picture, were shot in this fort. Ooty, the most sought-after hill station of South India, is definitely worth a visit. It is spread with lush greenery and beautiful vistas of the hills of the Nilgiris. A delight for nature lovers, photographers as well as adventure enthusiasts, Ooty has something for all. Visit places like the Ooty Lake, Rose Gardens, Thread Garden, Botanical Garden or go on a ride on the roy train that takes you through the mesmerising vistas of Ooty and Coonoor's scenic beauty. Bijapur is a heritage city that bears the influence of the Kalyani Chalukyas, Yadavas, Khalji Sultanates and Bahmani Sultanates. It is officially known as Vijayapur. 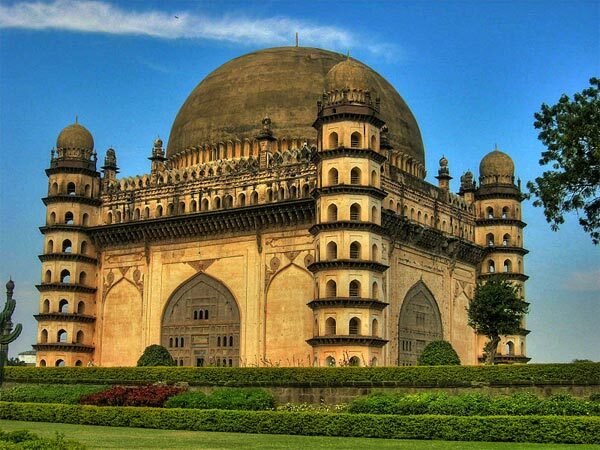 Gol Gumbaz is the city's most popular attraction, which is built in a classic Deccan architecture. Apart from the Gol Gumbaz, some of the places of interest in Bijapur include Ibrahim Rauza, Jumma Masjid, Upli Buruj, to name a few. The city of Aurangabad in Maharashtra has one too many remarkable historical monuments, making it a very popular tourist destination. The famed Ajanta and Ellora Caves that falls under the UNESCO World Heritage Site is located in Aurangabad. It is fondly known as the Cultural Capital of Maharashtra due to the same. Other beautiful places of Aurangabad include Bibi Ka Maqbara, Ghrishneshwar Temple, Daulatabad Fort, etc. Situated in North Karnataka, Gulbarga has many relics left by the royal Bahmani dynasty. Mostly these relics reflect a classic Islamic form of art and architecture. Floral designs on domed ceilings and calligraphic designs are some of the features of Islamic art. Tour through places like the Buddha Vihar, Gulbarga Fort, Sheikh Poza Dargah, or the Sharana Basaveshwara Temple on your visit to Gulbarga.